Riverbed SteelCentral provides a complete application performance monitoring solution for web, custom and packaged applications. Users today expect instant access and stable performance from application to stay productive. Monitor your applications’ performance across all devices and geographies. 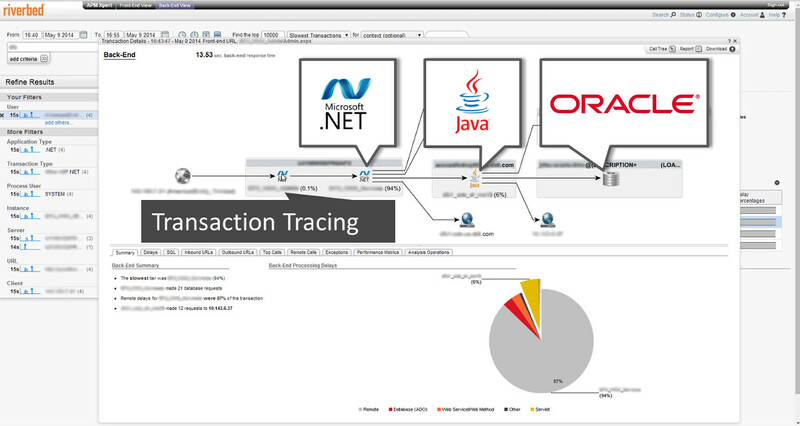 Analyze results to identify opportunities to improve application performance for all end users. Gain a better understanding on where you need to prioritize optimization efforts. Moreover, these products help to save your budget and improve collaboration in IT. Application troubleshooting with SteelCentral provides businesses with 10-30% IT budget savings. There is no need to recreate problems – the data has already been captured. Instead of looking around whom to blame for low performance or stability, collaborate on building applications and resolving issues. Performance insights tell you exactly where in the application, network or infrastructure you need to focus your efforts. Products, presented below, won awards from Gartner, positioning Riverbed as leader in various Magic Quadrants. This is how Gartner described Riverbed in 2014:"Riverbed's SteelCentral AppResponse and SteelCentral NetSensor technologies deliver highly effective packet-capture-based performance monitoring that can support both APM and network performance monitoring (NPM) requirements. SteelCentral AppResponse is also one of the few platforms in the market equipped with algorithms capable of interpreting Independent Computing Architecture (ICA) and other hybrid virtual desktop (HVD)-oriented protocols.". And we have all required knowledge and experience to help you implement the solutions and integrate them with other tools and existing systems. Do not hesitate to contact us with any cases and questions.